De Nieuwe Zaak is a leading full-service digital agency based in Zwolle, Netherlands. With a team of over 90 experts, they provide innovative, high-quality digital commerce solutions for retailers, wholesalers, and brands alike. They have been using VWO since 2012 to conduct A/B tests and optimize websites for many of their clients. Being such an extensive VWO user, they are constantly investigating how they can make use of the platform to make their processes more efficient and produce faster results. De Nieuwe Zaak recently started using the VWO Application Programming Interface (API), which has drastically improved the productivity of their development teams with regard to building A/B test campaigns by using VWO. They recently published a blog post sharing their experience using VWO and the API; you can read it here. De Nieuwe Zaak has more than 12 years of experience in implementing and creating web applications. In these years, they have standardized their development process. For them, setting up A/B tests is a collaboration between CRO & UX consultants and developers. The CRO & UX consultant analyzes the user research data and comes up with a hypothesis for an A/B test, and developers write the code for it. 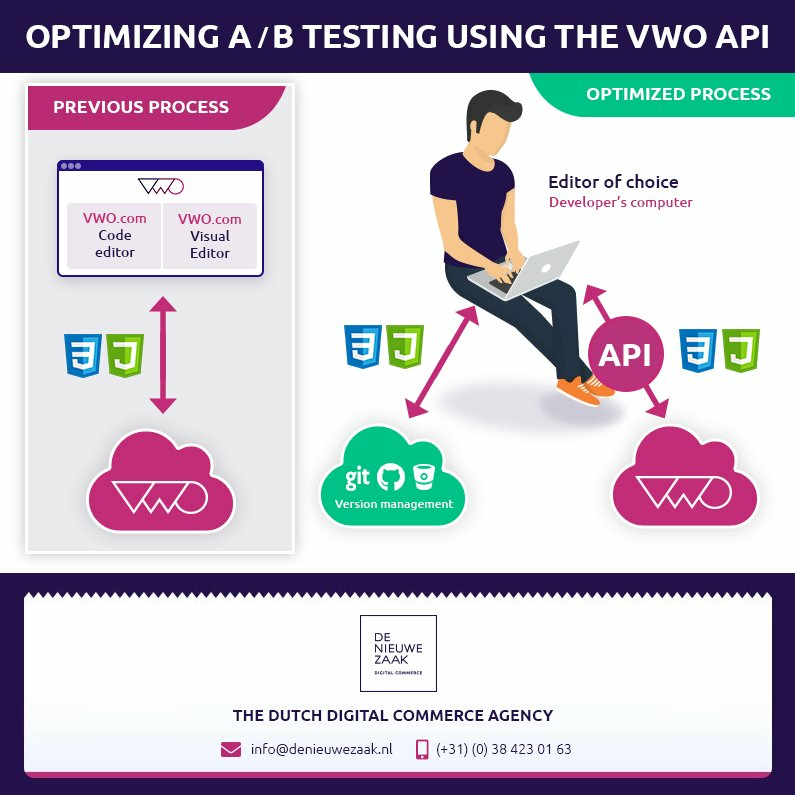 Before the front-end developers at De Nieuwe Zaak started using the VWO API, they used to write the code for the test variations on the VWO code editor. However, they wanted to be able to write code in the IDE familiar to them for improved efficiency. For any API to work, 2 applications are required. With one being VWO, developers at De Nieuwe Zaak wrote a small NodeJS application that now runs on their computers with the help of extensive documentation provided by VWO. The NodeJS application communicates with VWO by using an automated task runner called GruntJS and an asynchronous request initiated by the browser, also known as an Ajax call. Improve code quality by using SCSS, instead of plain CSS. Write code in an environment familiar to them. Ensure safety of their code by using version management. Create and extend the API link to further accommodate their use cases. Follow their existing processes and frameworks to develop websites. The VWO API is very extensive and is very well documented. At De Nieuwe Zaak, we use the API for visualizing reports in dashboards and implementing test. Particularly, the process of implementing tests with the API made the implementation more sustainable. The post How De Nieuwe Zaak Improved Productivity Using The VWO API appeared first on Blog.